When Reid entered the workforce he lost his way a bit when it came to fitness. Reid knew it was time to take action and realize his dream on competing. My freshman year in college I was introduced to the gym and instantly fell in love. In an attempt to gain as much knowledge as possible I began buying bodybuilding magazines and religiously reading articles on bodybuilding.com. All of the pictures inspired me to one day try entering a competition myself. I loved everything about the sport of bodybuilding. It was you against yourself, a 24/7 endeavor, not just a sport but a lifestyle. The highlight of everyday while I was attending college was coming back from class, mixing up my pre-workout supplements, picking up my lifting partner and heading to the gym. While attending school I made a tremendous amount of quality progress. 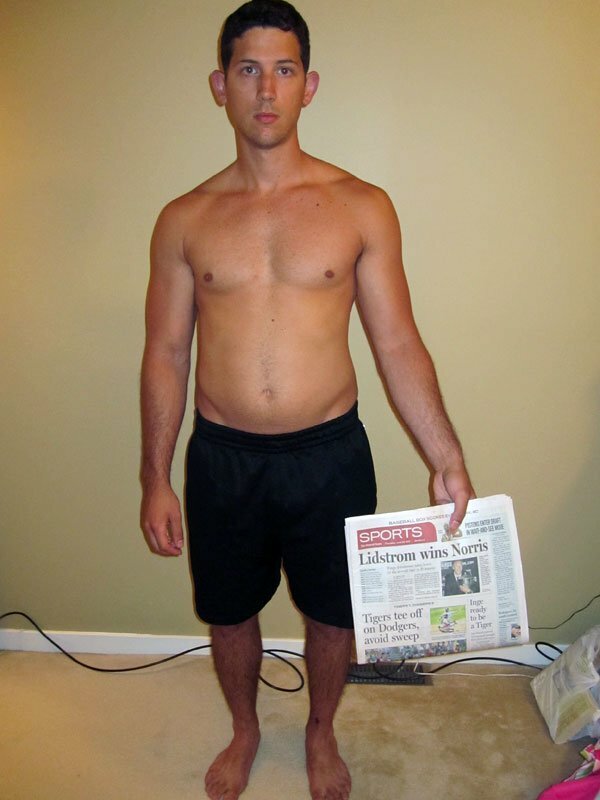 My endeavor began as a soft 130lb college freshman and ended my senior year as a very lean 175lbs. My progress didn't go unnoticed either as many of my peers constantly sought advice from me. Upon graduating and entering corporate America's 60 hour work week I slowly got out of shape. Year after year passed by and I kept getting more and more out of shape until I finally put my foot down and decided it was time to make a new transformation. No looking back - the future looks bright for Reid and his physique. In late 2010 after a couple of years in the workforce and very little time spent in the gym, I decided enough was enough. Priority number one was getting back into shape. I convinced myself that within one year I would realize my college dreams of competing in a bodybuilding competition. I began with getting into a schedule of lifting on a regular basis. At first my diet consisted of many empty calories, eating anything and everything put in front of me. After a number of months I was finally getting back some of the old muscle I once had. 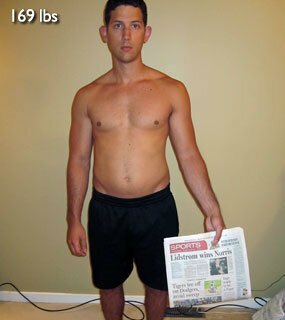 My weight was hovering around 170lb at somewhere between 16-18% body fat and needed to be in the single digits. It was time to focus on a cleaner diet. I began a carb cycling diet and started adding cardio every day. Four months later I stepped on stage and missed first place by 1 point on the judge's score card. Considering it was my first competition and the only time I've ever dieted to such an extreme, it was still a proud accomplishment. The entire experience has motivated me more than ever to continue on the path of building the best physique I can and look forward to competing again next year. It's time for me to spend some quality time packing on more muscle so I can move up a weight class and get that first place trophy! I tried to keep my supplementation as simple as possible with the majority of my results coming from diet and hard work. That being said there are a few supplements I consider to be a cornerstone of any bulking or cutting phase. I stuck to the basics I always used in the past which are: whey protein, creatine, glutamine, multi-vitamin, and fish oil but this time for contest prep I added a nictric oxide pre-workout, CLA, glucosamine, MCTs, amino acids and a fat burner during the last 4 weeks. The diet I followed was a cyclical ketogenic style diet. Before setting up my diet I determined my Basal Metabolic Rate or "BMR" and adjusted for activity level. Afterwards I subtracted 750 calories from that total in order to lose 1-2lbs/wk. There are many calculators found online or on bodybuilding.com. Once I had determined a caloric baseline to shoot for, I created a diet following certain parameters. The macronutrient breakdowns I followed were very close to those presented in Dr. Warren Willey's book "Better Than Steroids". The diet plan I attempted to recreate was the "modified carb drop" plan in the aforementioned book. 3 low carb days followed by a high carb day. Only consume simple, high glycemic carbs upon waking and pre/post workout. Calories per meal progressively get smaller throughout the day. ie) Largest meal at breakfast with smallest being my last meal. Train your most lagging bodypart the day after your high carb day (glycogen stores are maxed). I trained each body part twice per week allowing at least 48 hours rest before hitting upper body or lower body again. Every few weeks I would begin to feel overtrained (due to the low calorie diet and high volume of training). As soon as I would begin feeling overtrained I would take an extra day or two off for rest. In retrospect I believe hitting each body part twice per week with the higher volume was way too much for a contest prep. For each exercise I would perform 8-12 reps to failure for 3 sets per exercise. Rest periods remained relatively short, between 45-60 seconds. I performed cardio each day in the evening using a stairmill for 20-30 min with my heart rate around 130-145 bpm. 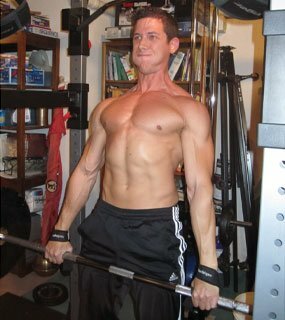 Ask questions and read through the thousands of articles on bodybuilding.com. This is such an individual sport. Nobody's body reacts the same. Test different methods and see what works for YOU. Aim to consistently progress forward. Adding weight is only one form of progression. You can also shorten rest periods, change your lifting tempo, add volume, etc. Play with all the variables available. Listen to your body but be tough, don't cheat yourself by skipping workouts every time you're feeling a little tired or sore. Diet is 60%, training is 30%, supplementation is 10%, but attitude is 110% of the game. When things get tough fight through it - don't cave in. It's easy to cheat on diet with a soda or dessert, but consistency is the key to this game. You have to be mentally tough to reach the extremes required for a bodybuilding competition. The rewards are tremendous. From the satisfaction of seeing your own transformation to the attention by others who are inspired by your physique. Have fun with it and enjoy the time you have in the gym. Training is the highlight of my day!